Goal Bowling Chart View: Minor improvements to filtering and display of projects. Fix refresh issue where new project would not display after adding. New Custom Field added for Users Table. You can use this field to keep track of Certification Levels or any other User specific attribute. The user table is now exportable with this info included. Goal tile view now shows Parent & Child Goal names as clickable links. 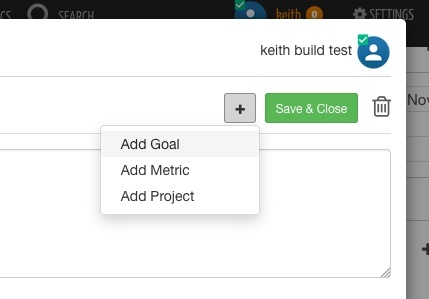 Goal Detail View now has option to add new Goal/Metric/Project from this view. Some Improvements to Drag & Drop in Chrome: added to Timeline views. Change task start & end dates by dragging & dropping. Projects: Project Benefits within a single project can now be filtered by year. Project Start & End Dates now have separate values for Planned & Actual. Acutal Completion Date will now show an Estimated completion based on the last scheduled task due date. Fixed issue related to application not reloading cache when new version is released. This should reduce the need to “refresh” the cache after a new update is released.